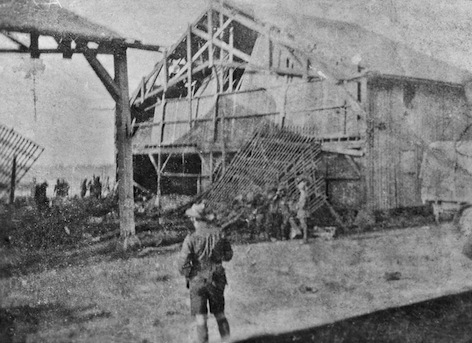 Casualties were was so high for the first shell because its force shattered the main beam holding the slate roof of the barn in which the men were sleeping. As a result slate fell to the ground and sliced through anyone and anything in the way. The collapsed beam crushed any in the way too. My interest has been piqued due to my grandpa being in that barn for a part of that night. It was his first night back after a lengthy spell recovering from a wound. Family sources suggest that Ted moved away before the attack either because he was too hot and couldn’t sleep or because he’d been invited to listen to the battalion band in another barn. A combination of both stories is possible - it was a very warm night and the band were close by (the second shell hit that barn - the understanding is that Ted went back to help his mates in the first barn before the second shell struck). In any case, fate proved most fortunate for him and, following on from that, me and my family. Friends, I have some observations to make and a few questions and enquiries for which I would appreciate some assistance. Allonville, at the time, was 9 or 10 miles from the German lines. What made them attack in such a precise, long distance manner? Are there any docs or views from the German side of this incident? Wounded were taken to a number of CCSs but one, at Crouy, was quite a distance away. Was that a medical or practical move? 3 of the wounded died at Crouy (5th CCS), 2 at Vignacourt (20th CCS), 4 at Longeau (10th FA), 1 at Allonville (4th FA), 1 at Rouen (3rd Stationary Hospital) and the last, two weeks after the attack at Birmingham (1st Southern Hospital). Amazing stories of luck and courage happen in all aspects of war. Here’s how Newton Wanliss described a few of the men. Any information on the unnamed man would be appreciated. I wonder how Harry fared when he returned to Australia? 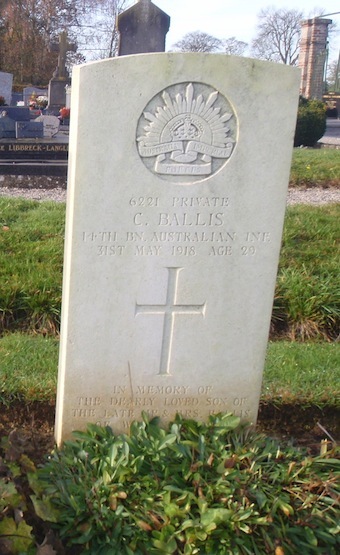 In a nominal role gathered in the early 1930s he gave his address as the Soldier’s Memorial Hall, Oakleigh. That’s all I have on him. Photos of the barn taken the next day. Can anyone find a more precise reference for the barns? To my knowledge, they do not exist anymore, nor does the nearby chateau which is referred to in a number of sources. The barn was rumoured to belong to the Hennessy family - of brandy fame. I’ve also read somewhere that the Hennessy family may well have owned the chateau mentioned above. No proof in any form. 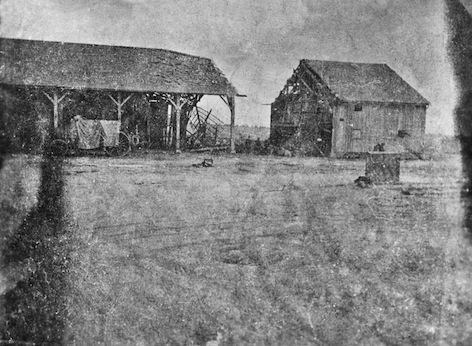 La Hara farm was also mentioned in the battalion war diary. I can’t find any other reference to such a place. Any thoughts? To the north of Allonville lie the Bois de Chateau and the Bois de Mai. There is another unnamed wood to the south - beginning at the map ref above. Is it the Bois de Allonville mentioned in the war diaries? I assume so but would love confirmation. Another company was placed there in the days prior to the attack. 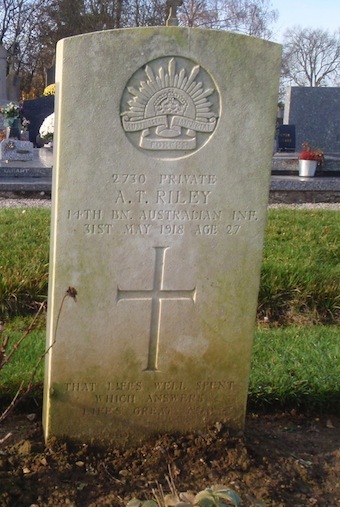 There are 18 men buried at Allonville cemetery - 13 who died outright from A company and 4 from the second shell. 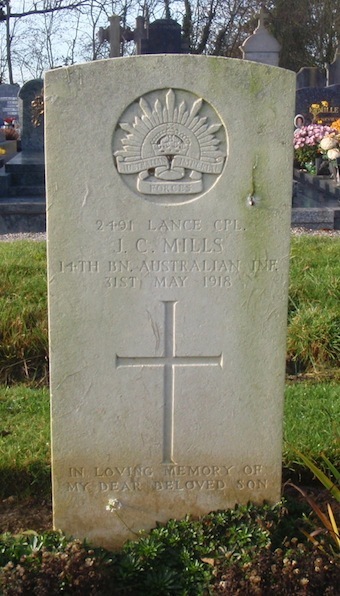 The 18th was John Mills who DOW at the 4th FA shortly after the attack. 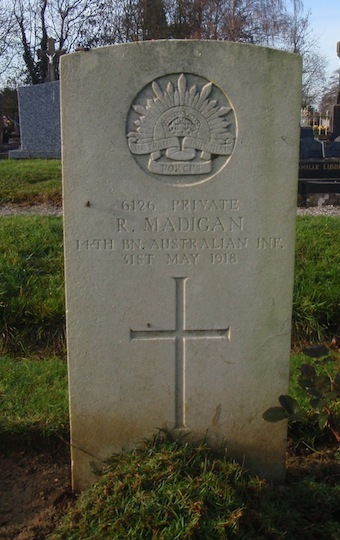 The 4th FA was placed in the nearby Bois de Mai at the time. Wanliss appears to be confused over the deaths caused by the second shell, as are the battalion and brigade records. 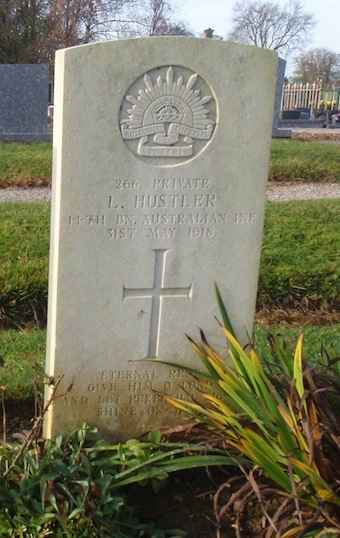 The claim of 5 deaths (2 band members, 2 scouts and a signaller) doesn’t add up to the 4 men accounted for at the cemetery and in the list (Wanliss pp290, 291). In all the sources I’ve found I can’t work out the difference. Certainly, it was a confusing and stressful night for the battalion and I wonder whether Mills may have been counted as the 5th man by the officers at the time. Mills, though, was definitely hit by the first shell and definitely in A company. 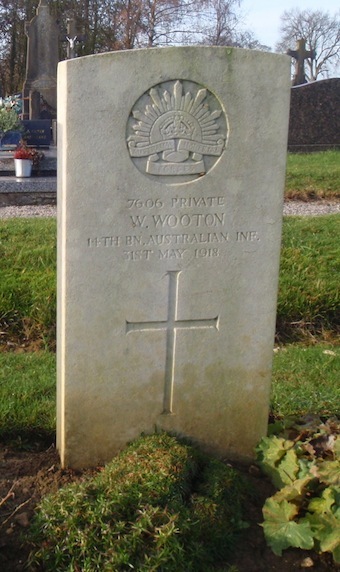 He is Wooton on the headstone but nearly everywhere in his records and, particularly how he wrote his own, it was Wootton. 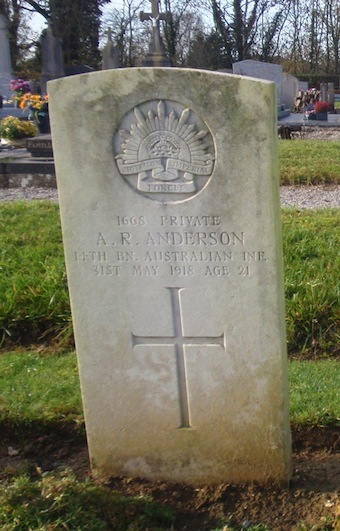 On one letter (from the Australian Graves Services) both spellings are used. Quite bizarre really. Photo request for the following please, if possible. "I wonder how Harry fared when he returned to Australia? 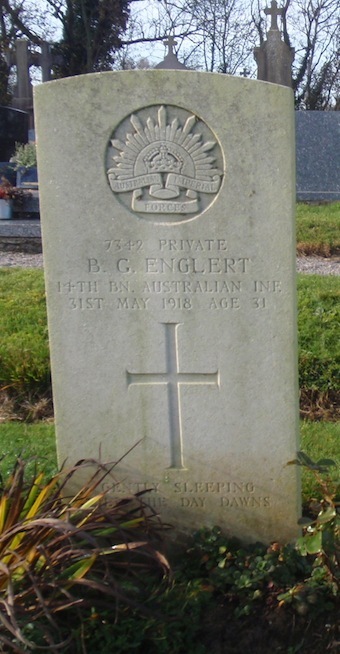 In a nominal role gathered in the early 1930s he gave his address as the Soldier’s Memorial Hall, Oakleigh. That’s all I have on him." 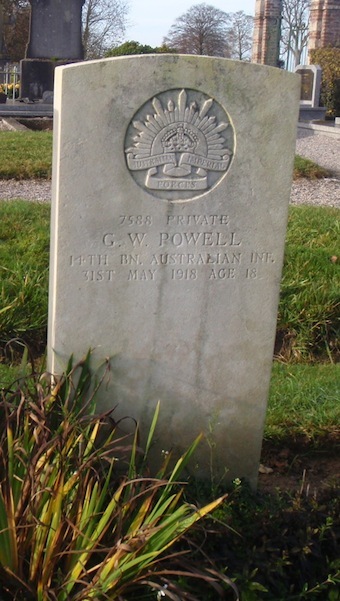 REYNOLDS, Henry Robert – On April 30, at his home, dearly loved husband of Margaret, loving father of Charlotte (deceased), Caroline (Mrs Patterson), Henry, Phillip, and Margaret (Mrs Williams), fond father-in-law of Neil, Violet, Nancy, and Peter, loved grandfather of Harry, Margaret, Robin, Yvonne, and Maree, aged 78 years. – Thy will be done. 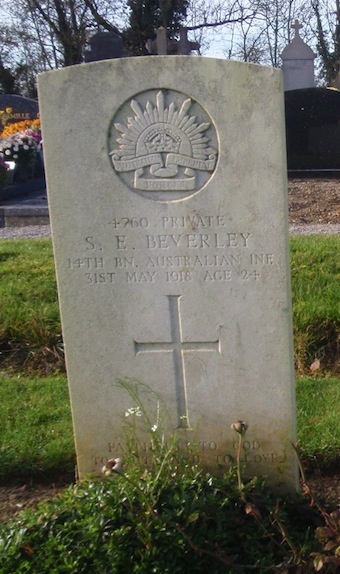 REYNOLDS – The Funeral of the late Mr HENRY ROBERT REYNOLDS (late 14th Battn, 1st AIF) is appointed to leave the late residence, 16 Richardson street Oakleigh, on MONDAY, after a service commencing at 1.30 pm for the Springvale Cemetery. I'm not at my home base at the moment so I can't check on Barrett - the name is familiar though and I may have missed him. Thank you for the info on Harry. 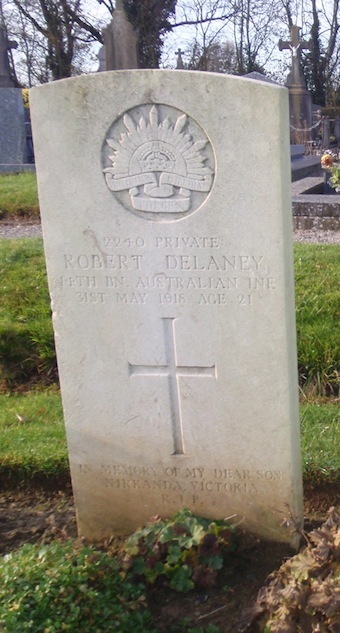 I'm pleased he kept going for so long but obviously had much sadness with which to deal as his daughter pre-deceased him. 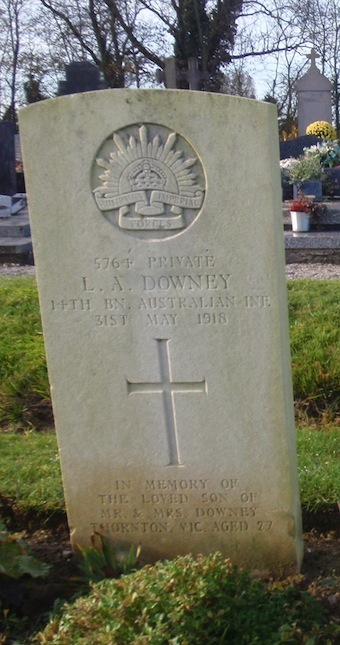 I believe it was up to the family to apply to have an AIF memorial plaque placed on the grave. In any case he deserves one. The POW story is quite likely. 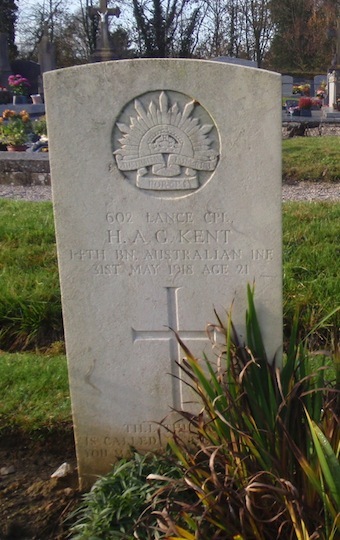 A friend is undertaking a PhD on Australian POW on the Western Front, and has accessed German records. I recall him mentioning this, but by the time the Germans received the information the 3rd Division HQ had moved. His study shows that POWs gave the Germans quite a bit of useful information. A divisional HQ would be a high priority target for artillery. I always liked it, too, but think that a combination of factors linked to form the final response. What a story Patrick Barrett seems to have! 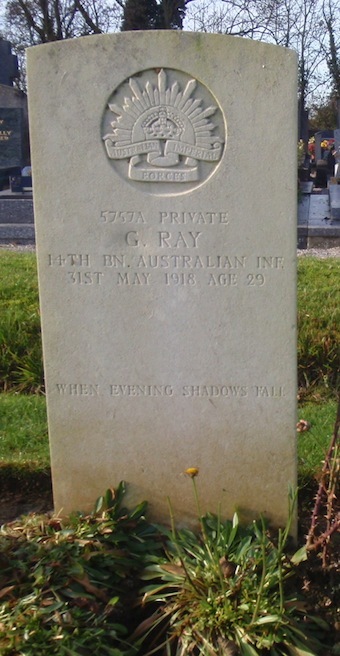 I thought for a few moments that with such a low number (542) he was an original but looking at his records note he joined up in 1916 to the cyclists coy and only in Feb 1918 was he taken on strength with the 14th. Fascinating that he hasn't been included in Wanliss' list nor does he appear in the appendix to the edited 'Jacka's Mob' rolls. He's not included in any of the Red Cross files linked to the 14th either but I'm yet to check whether he may appear in another area. The question begs - how did you come across him? And, are there others that have been missed? Some more digging is on the way! Nothing in the Red Cross files at all. Well done on doing these men justice and keeping their memories alive. Also for prompting me to learn what the occupation of 'boot clicker' entailed. Hopefully a whole lot more information will surface and we can see the memories truly honoured and enhanced. Makes a lot of sense to me. Thank you for your efforts. I am pleased that it's only the one extra. 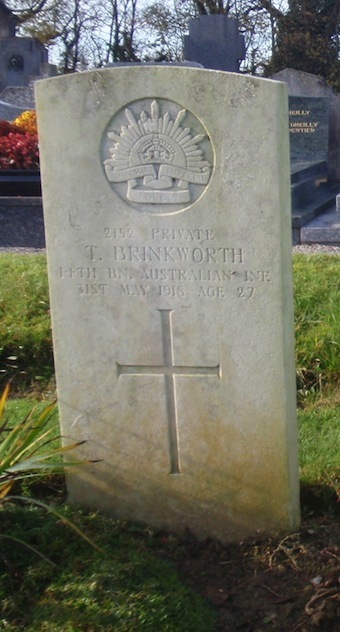 "7th Brigade recovered German intelligence material which stated that Australian troops captured at Morlancourt disclosed the location of the 3rd Division headquarters at Allonville. 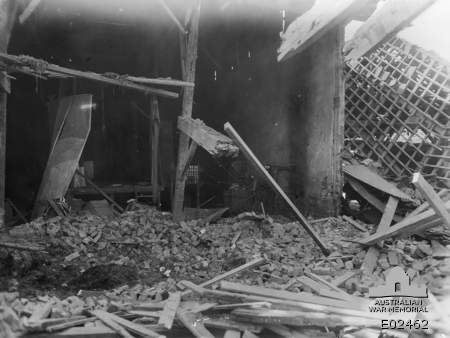 It was subsequently shelled by a German rail gun, although two rounds hit an adjacent barn in which two companies of the 14th battalion were resting." He has written an article on it in Wartime issue 57. Wartime 57 is now on its way. Thanks to all who have responded and to those who have perused. The more I dig, the more questions I find - I think I'm on the way to becoming obsessed which is rather dangerous in my current situation! What may have become lost in all the information I showed and sought after is a request for a view from the German side. If any of you have information or can lead me towards such research I would be very grateful. A good article indeed thank you Chris. It didn't cite any references, though, and I was wondering whether you could get your mate to contact me (please, please) so I can follow up a few points. PS. I will try in another forum for any information from the German point of view. Somehow, the lack of a response to this aspect has surprised but then again, I don't know where to look either. 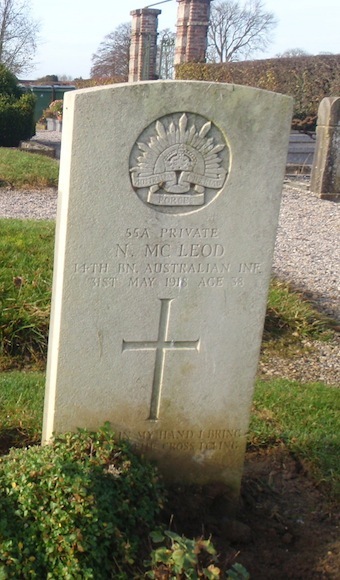 Thanks to Peter Bennett and Paul Le Trevier I have the photo of Frank Newbold's grave at St. Sever. 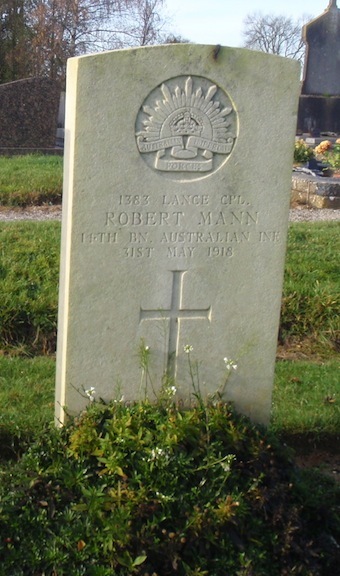 It's a beautiful shot of a lovely headstone. My thanks to Peter and Paul for their efforts. Have to say I've tried in other Forums and received absolutely zero. Either the information does not exist or I'm asking the wrong questions. So, if anyone out there can help me by giving any lead to go on I would be most grateful. The information I seek is, which German Unit(s) were near Amiens on the night of 31st May 1918? Which ones may have fired the artillery shells which were directed at Allonville? Which air service may have directed the operation? 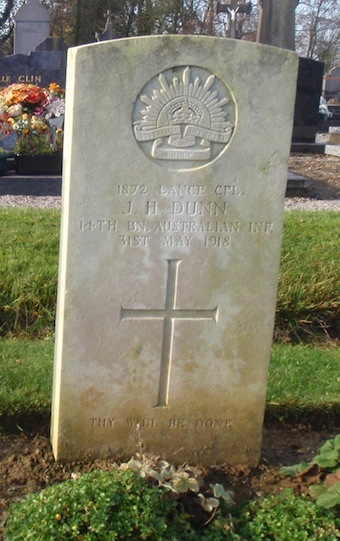 Are there any records or war diaries which may support any of the evidence?